The first thing to know about ECE Volunteer Tricia Beseda is that she doesn’t waste any time making an impact. She has been volunteering with FloCrit since mid-January 2019 and in just under two and a half months she has already volunteered over 100 hours in the FloCrit ECE! A retired nanny, Tricia found FloCrit on the news, and after reading about our mission online, came in for a volunteer orientation. 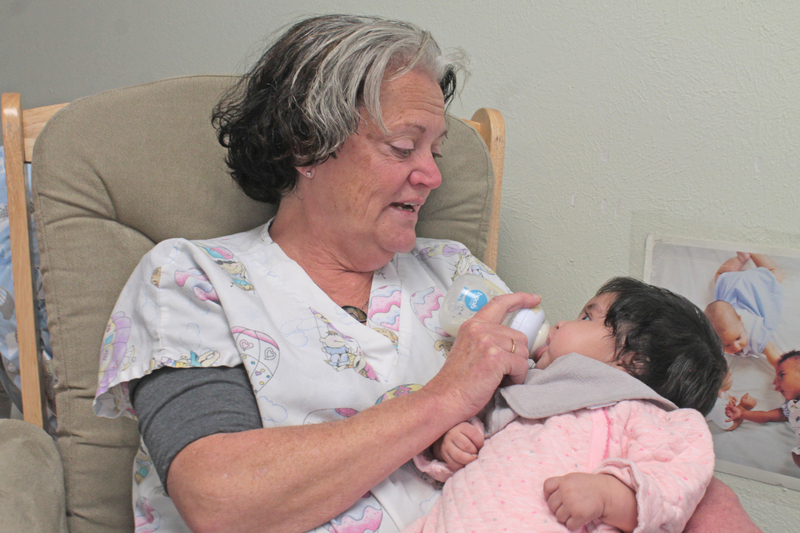 FloCrit appealed to her because our mission and services resonated – and of course, the bonus of holding babies! For her part, Tricia really feels like she is making a difference. “I expected the babies to be my favorite part of volunteering, and I guess it is, but what was unexpected was meeting and getting to know the moms and teachers and developing really great relationships with them.” She thinks anyone considering volunteering at FloCrit could find a place in the organization, and of course, the help is always appreciated. When Tricia leaves FloCrit, her work is nowhere near finished – she goes home to her husband Jim, their three dogs and two donkeys named Mora and Dottie!